신라말 도선이 창건한 도갑사 해탈문 안에 있는 목조동자상이다. 국보 제50호로 지정된 해탈문은 앞면 3칸·옆면 2칸의 단층건물로 동자상은 뒷쪽 좌우칸에 모셔져 있다. 사자와 코끼리를 타고 있는 두 동자상은 총 높이가 약 1.8m가량이고, 앉은 높이가 1.1m 안팎으로 크기도 비슷하고 조각기법도 동일하다. 다리를 앞쪽으로 나란히 모아서 사자, 코끼리 등에 걸터앉은 두 동자상은 동물상과 따로 만들어 결합하였으며, 두 손도 따로 만들어 끼웠다. 현재의 손도 후대에 다시 만들어 끼운 것으로 생각된다. 두 동자상의 머리를 묶은 모양새는 매우 화려하며, 이목구비가 원만하여 동자의 천진스런 모습을 잘 나타내고 있다. 사자와 코끼리를 타고 있는 점에서 지혜의 상징인 문수보살과 실천의 상징인 보현보살의 화신으로 추정되며 사자와 코끼리를 탄 동자상이라는 드문 예 가운데 목조상으로서는 유일한 작품이다. 1960년 해탈문을 해체 복원할 때 발견된 기록에 의하면 해탈문이 1473년에 건립된 것으로 밝혀지고 있어 이곳에 모신 동자상도 문이 건립될 때 함께 만들어진 것으로 추정되고 있다. These wooden statues are enshrined in Haetalmun Gate of Dogapsa, a Buddhist temple founded by Doseon in the late Silla Period. Haetalmun Gate is a single-story building measuring three kan (unit of measurement referring to the distance between two columns) at the front and two kan at the side and is designated as National Treasure No. 50. 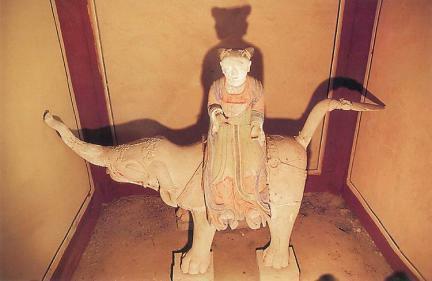 The two statues, riding a lion and an elephant, are about 1.8 m tall; their sitting height is around 1.1 m. The sizes are similar, and the same carving technique was used. 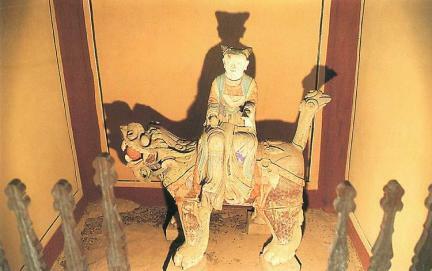 These statues, with their legs gathered at the front, were combined with the statues of animals after separate production. The present hands are believed to have been inserted again in the later period. 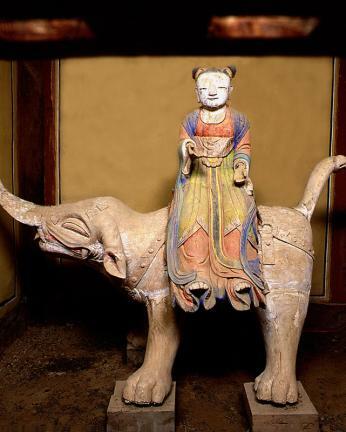 The hairstyle of both statues is very magnificent, and the harmonious features express the childlike Buddhas well. They are believed to be Manjusri Bodhisattva, a symbol of wisdom, and Samantabhadra Bodhisattva, a symbol of practice, judging from the fact that they are each riding on the backs of a lion and an elephant, respectively. 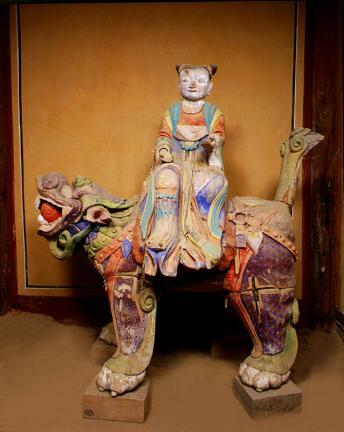 It is the only wooden work and a rare example of the statues of young bodhisattvas riding a lion and an elephant. According to the record discovered during the restoration of Haetalmun Gate in 1960, the gate was built in 1473, and these statues are presumed to have been made together with the gate.